So if you read any of the above articles and would like to cut HFCS from your diet I would love to share what we have done and where we look for it. (Please read our Mediterranean Diet Page for more info on how we came to believe this mattered). Where to look: Every grocery store item has an ingredient list and I’ve read more than I would like to count. Take your reading glasses or a magnifying glass if needed, I swear they make them the smallest print to keep you from paying attention to what is really in our food. This is time consuming in the beginning but after a while you won’t have to look near as much. A good start is to go through the items in your pantry and fridge, I hope you don’t find as much HFCS as I did. Breads – Most mass produced national brands have HFCS, I buy Aunt Millies bread and buns, they have No HFCS right on their plastic package. Fresh Bakery breads are great but check ingredients to be sure, I have never found HFCS listed on these. These are the only places I can find RYE bread without HFCS. Update, aunt millies now makes a rye that is HFCS free. Crackers – this is a tough one, my only luck is with our local stores organic pita crackers and we love them. Most others have HFCS . update: woohoo, town house pita crackers are HFCS free and they are wonderful..
Canned Cranberry Sauce – full of HFCS, next thanksgiving buy a bag of fresh cranberries and cook them up ( i will post my recipe) they are way better anyway. Canned tomatoes – check labels. This one is the most inconsistent for me. It seems like if it is just diced tomatoes they are usually ok but as soon as they add things like chopped onions or chilies they add HFCS. I play it safe and always check label. Peanut Butter – Peter Pan says no HFCS on label but Jif doesn’t have it either. I just appreciate Peter Pan putting it right on front label so I don’t have to get my reading glasses on and check. Salsas vary by brand but check label. We by Chi Chi’s, none there. BBQ sauces – Another tough one. I have yet to find one without it so this is our exception, we love Jack Daniels original BBQ sauce but we don’t eat it all that often so we splurge here once in a while. If anyone has a good recipe for homemade I would love the recipe. Salad dressings – again lots of HFCS so I make my own. Mayo and miracle Whip – Hellmann’s Real mayo is fine as is their “light”, but the hellmann’s low-fat has HFCS, Miracle Whip HAS HFCS. Jellies – Most have HFCS, look for homemade brands or Smuckers Simply Fruit, it is HFC free. Cocktail sauce – all have HFCS, make your own with Hunt’s HFCS free ketchup and horseradish. Baby food – looking into this, I haven’t bought any in years but if it is in there they should be ashamed!!! Soda’s – it’s there, read label. When i do drink soda I drink diet but i’m not sure that is much healthier. Working on eliminating it completely but I have yet to attain that goal. Anything Low-fat – if it says low fat I am immediately suspicious, seems like such a dirty trick to con people (especially diabetics) that they are eating something healthy when in fact it’s just full of HFCS, again, read label. So when you go out to dinner it’s really tough to avoid HFCS cause you know it is in their ketchup, salad dressing, breads, etc etc….I try to keep in mind what it might be in while I’m ordering but as long as I know I have cut our consumption of HFCS to a minimal amount at home I enjoy my dinner and keep it in perspective. If you find products with HFCS that you would like to add to this list email me at Harpercreekcreations@aol.com. I am also looking for a chart I saw a while back tracking the amount of HFCS added to our foods compared to the growing obesity rate since the 1970’s, it was stunning how they both increased together and created an obvious observation for holding HFCS guilty of effecting our weight. I will keep trying to update this list. Corn Refiners are trying to dispute findings about HFCS to save their business, two websites are listed below that address their attempt to say HFCS’s are ok. Don’t believe them. if you only read one link on here please read the above one…it is stunning! 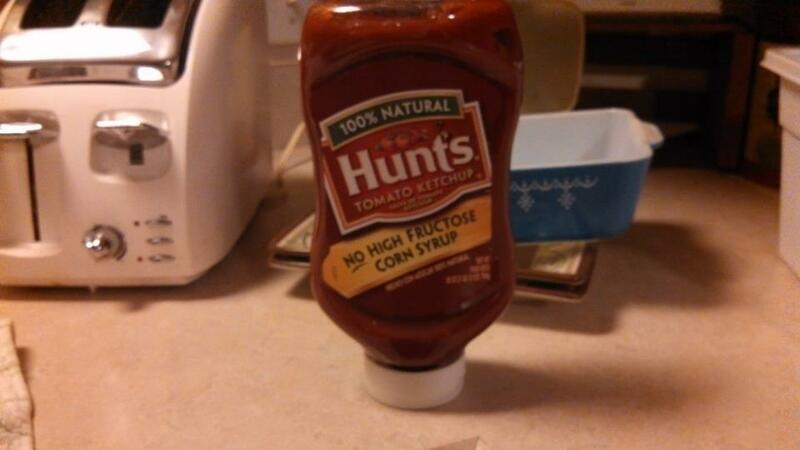 re: above picture, thank you Hunts for at least one ketchup HFCS free!!!! This is a great list and I am sure very helpful to many people who never read labels. It is good to see that so many companies are making the change. It is still better to just make it yourself, then you are positive about the ingredients. thanks Pam, I’ve read way to many labels but it is worth it.